Microscan will demonstrate LVS® label verification and print quality inspection solutions from Booth #110 at the 2016 INFO*FLEX Expo, March 7-8 at the Fort Worth Convention Center in Fort Worth, Texas, U.S.A.
Microscan, a global technology leader in barcode, machine vision, verification, and lighting solutions, announces that it will demonstrate LVS® label verification and print quality inspection solutions from Booth #110 at the 2016 INFO*FLEX Expo, March 7-8 at the Fort Worth Convention Center in Fort Worth, Texas, U.S.A.
At INFO*FLEX, Microscan will offer live demonstrations of our state-of-the-art label inspection systems. Visitors can learn how Microscan products can ensure standards compliance in a click, verify print quality in real time, and integrate into printing equipment to prevent labeling errors at the source. Microscan barcode verifiers provide a consistent software environment that is scalable across a number of product configurations: the LVS-9510 Barcode Verifier for stationary desktop verification and the LVS-9580 Handheld Barcode Verifier for complete mobility in an ergonomic handheld design, which will both be on display at the Microscan booth. Barcode verification software grades codes against GS1 and ISO/IEC barcode quality standards and offers detailed analytical tools for verification, reporting, and diagnosing quality issues to enable independent problem-solving. All barcode verifiers are 21 CFR Part 11 compliance-ready. With Microscan’s 25 August 2015 acquisition of verification systems innovator Label Vision Systems (LVS), Microscan’s technology portfolio now comprehensively addresses factory automation challenges from product packaging and labeling compliance to full-scale product inspection, tracking, and traceability throughout the supply chain. Microscan’s suite of barcode and print quality verifiers provide both inline and offline verification of codes (symbols and text) printed on labels and packaging. Verifiers identify errors in code readability and compliance as codes are printed, allowing manufacturers to address printing or formatting issues before incurring fines and scrapped product down the supply chain. 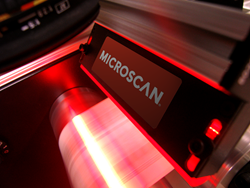 Microscan offline verifiers enable users to test newly-designed labels for quality and compliance issues before printing, while Microscan inline verification systems are configurable into manufacturing lines and printers to check label accuracy on the fly during label application. These verification solutions address the growing need for compliance to the FDA’s Unique Device Identification (UDI) initiative, as well as other regulated barcoding and product serialization standards. For more information about Microscan, please visit http://www.microscan.com or at Booth #110 at INFO*FLEX 2016. Microscan’s dedicated LVS product team will be available throughout the show to discuss print quality and verification challenges with visitors to the Microscan booth. Consumer products companies and printers/converters may receive complimentary show access (a $190 value) by submitting a Microscan VIP Pass by Wednesday, February 24.